2018 Topps Walking Dead Autograph Collection is an all-signature set that offers subjects from the entire TWD series. Unlike the normal solicitation pattern from Topps, there is a very short window from the initial announcement to the release date. Only issued in a Hobby format, the product contains one card per box, but it is guaranteed to be an autograph. As the name makes clear, TWD Autograph Collection is all about autographed cards. A signature comes in every box and each autograph card is serial numbered to 99 or less. It is also encased. 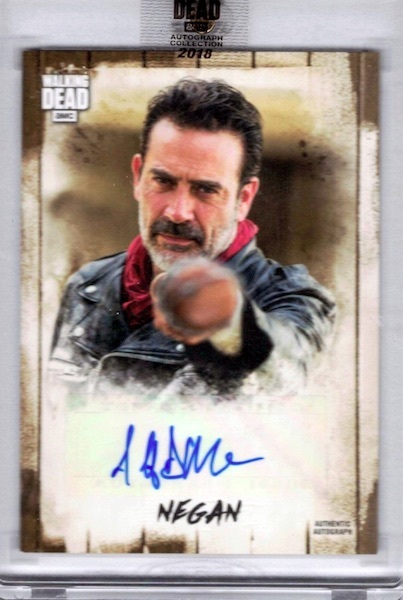 The 2018 Topps Walking Dead Autograph Collection checklist boasts over 50 signers, including some of the bigger stars from The Walking Dead. 56 cards. 1 per box. Serial numbered #/99 or less. Buy autographs on eBay. Pretty bummed out there is no Andrew Lincoln as Rick Grimes card in this series.